No, not really. The Score-A is perfectly serviceable, and even has a couple of features that are very handy for the gamer on the go, but some poor design decisions and a relatively high price mean that it sits squarely in the middle of the pack. It's a surprisingly solid controller and I can't seriously fault it on any technical merits, but a couple of changes (and a more reasonable asking price) would have made it much more competitive in an increasingly crowded market. The Score-A takes your basic console controller and shrinks it by about thirty percent. The usual Xbox and PlayStation buttons are all here: left and right thumbsticks in a parallel Dual Shock configuration, primary A/B/X/Y buttons on the left, a rounded D-Pad on the right, unobtrusive start and select buttons, and two shoulder buttons on either side. All four shoulder buttons use the standard membrane design - there are no triggers. 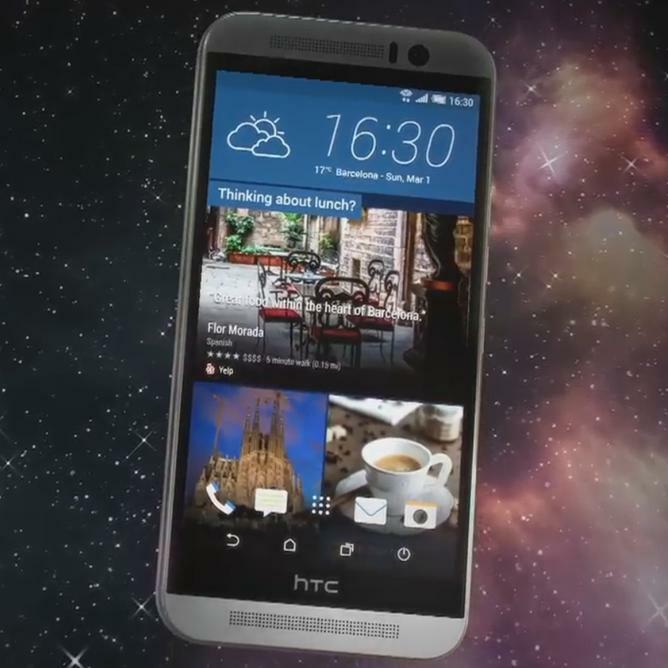 In addition to these you get Home and Back buttons for easy navigation in Android without touching the screen. You also get a "connect" button, but since the controller automatically searches for paired devices when it starts up, I found little use for that. The navigation buttons are squeezed in between the thumbsticks. This could have made them awkward to use, but the relatively small size of the controller means that most people will be able to reach them easily with either thumb without removing a hand from the grips. Speaking of grips: these are rather nice. 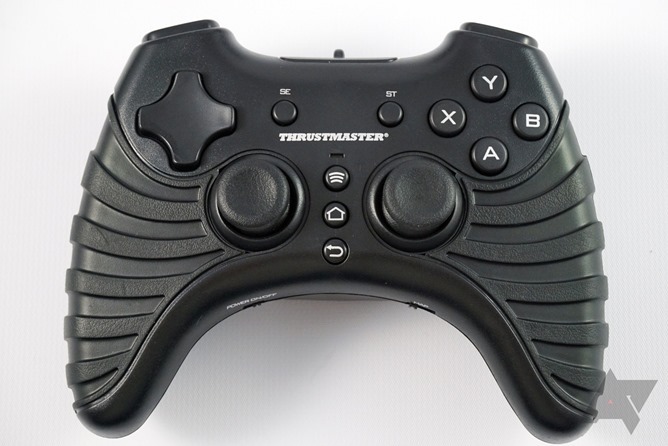 While most controllers go for a smooth plastic finish, Thrustmaster opted for grooved soft-touch plastic that really sticks to your palms. 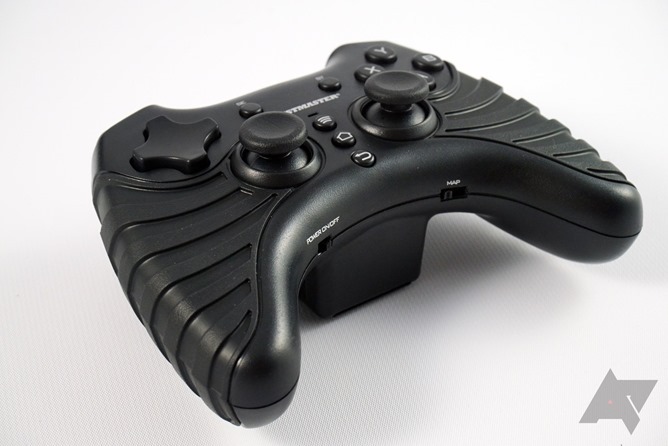 This was probably to help aid grip for people who are used to the more meaty "wings" on the Xbox 360 controller. Tucked up underneath the grips are the power switch and the mapping switch, the former for turning the controller on and off, the latter for switching between modes for Android and PC. Underneath all of this is the battery bay. It is enormous. Okay, so that might be a bit of an overstatement: compared with the rest of the controller, it feels enormous. This chunky block holds three AAA batteries (no rechargeable option) in an odd 2x1 configuration. It seems like the bay was originally designed to hold four AAAs, but for whatever reason there's a big gap in there. The bay does have one advantage, if you can call it that: when the controller is set down, the bay extends out from the trigger and handles by .25-.5 inches, so it sits nice and regular. The downside is that this is a severe blow to portability. On the other hand, three AAA batteries should make the controller last for a good long time - the included batteries lasted through the several hours of testing that this review required. A lack of any unnecessary LED ornamentation or vibration motors means that a trio of batteries will probably last you through a week-long trip with ease. Even so, I would have preferred a more convenient rechargeable battery. Playing games with the Score-A is nice. 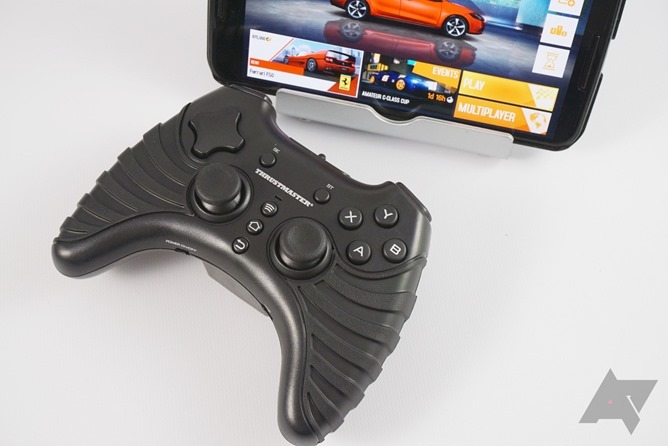 It's not the top-of-the-line feel you get from a first-party Xbox or PlayStation controller (or the SHIELD's copycat version), but then, none of those can be easily connected to a standard Android device. The shrunken-down body of the Score-A is surprisingly a non-issue - the buttons and sticks themselves are only slightly smaller than dedicated gamers will be used to, and the grooved grips on the handles mean that it stays in your palms even for extended sessions. It's not the most comfortable controller in the world, but thanks to its size it's a much better ergonomic option than intentionally tiny gamepads like the MOGA or the iMpulse. The analog sticks deserve particular praise. 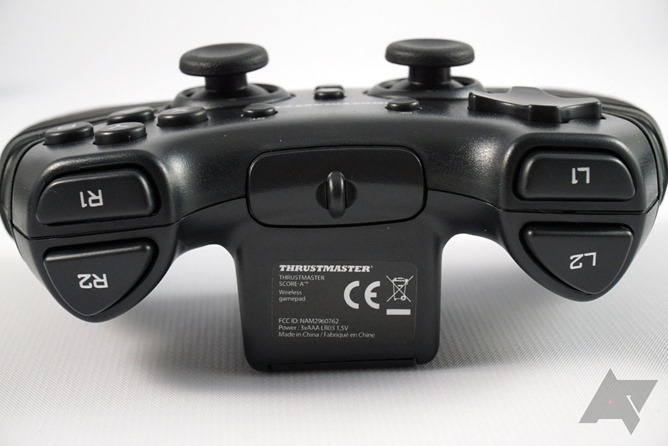 Though they're smaller than the sticks on a full-size controller, they manage to maintain an ideal combination of resistance and flexibility. The rubbery texture on the top keeps your thumbs firmly in control, and when you release, they revert back to the default position with no deviation. The D-pad and face buttons are alright. Again, they're not up to the standards of a first-party controller (particularly because of the short and loose travel between pressing and activating), but they're more than adequate for standard gaming. While playing my go-to fighter Soul Calibur, I was able to get into the quick and tricky timing of Maxi's nunchuck attacks with no difficulty at all. The Score-A's shoulder buttons are a definite low point, with awkward spacing and a long, mushy action - this was often a problem for controllers that copied the double shoulder button design first used on the original PlayStation. They're just not very comfortable, especially if you favor the index + middle grip style. In Asphalt 8, where the default controller layout depends on shoulder buttons for acceleration, braking, and drifting, I often found myself turning into a spin-jump a noticeable fraction of a second early or late. By default the Score-A uses Android's standard controller API. While it isn't universal, it's being adopted by more and more developers both big and small, especially since the launch of Android TV. That should have you covered for most of the big blockbuster titles that actually benefit from conventional controller input. The controller also comes with two other modes, PC, and, uh, Other. The PC mode is self-explanatory. Exactly what "other" means isn't clear, and the single-page manual that's barely more than a set of instructions offers no explanation. When testing the controller out on Android it doesn't seem to pretend to be a keyboard (as some controllers do - it's handy for emulators). The Other mode simply seems to scramble some of the control mappings around. It's not useful unless you need a secondary map setting, perhaps if you run multiple emulators on the same phone or tablet. The Score-A should work fine with any Android TV device, though I don't have any handy to test. For that purpose it should be better than a lot of alternatives thanks to its Android navigation buttons... but probably no better than the official Google controller from ASUS. When I paired the controller with my gaming PC for a little Shadow of Mordor action, the game couldn't recognize the controller even with a manual configuration. I couldn't get it to work with any of the other games I tried either. I wouldn't recommend the Score-A for cross-platform use. 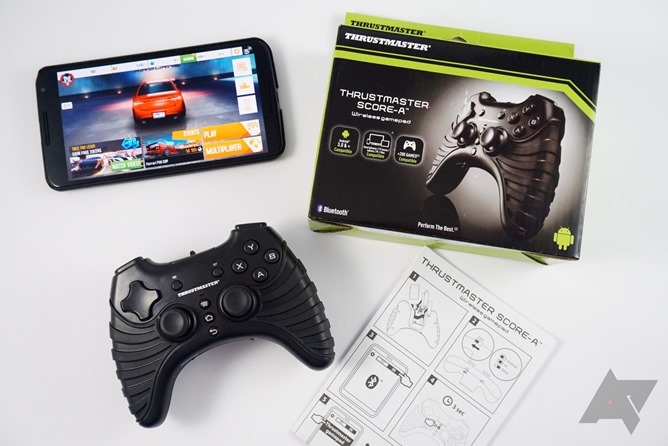 Thrustmaster doesn't make an app for the Score-A. There is no option for custom-mapping the controller on its own, or for mapping the physical controls onto the touchscreen. You'll have to rely on third-party apps if you want that functionality, and I've yet to find a reliable one. The Score-A's suggested retail price is $44.99. Compared to first-party wireless Sony and Microsoft controllers for consoles, that's not bad - it's a small discount on the "official" model with an acceptable drop in quality for the lower price. 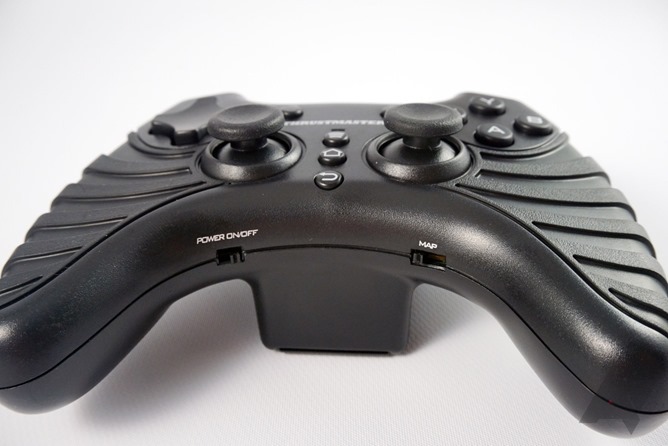 It compares favorably to the $60 SHIELD controller (which doesn't work with non-SHIELD Android hardware). 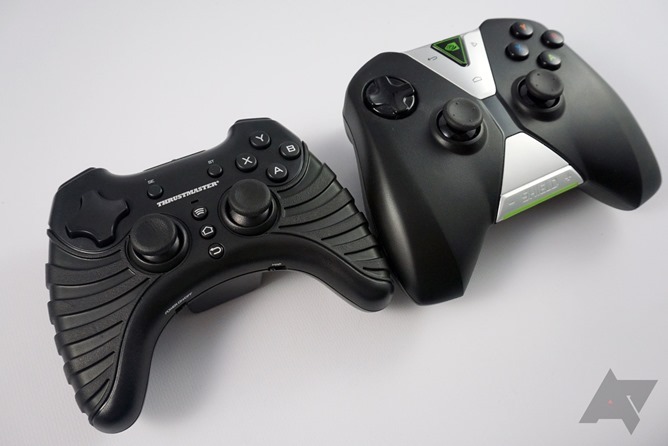 But there's no "first-party" controller for Android... unless you count the ASUS model for the Nexus Player. 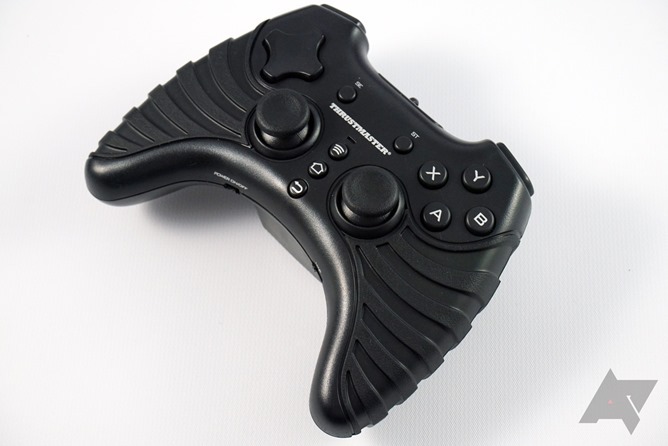 That controller sells for $40 in the United States, and yes, it does work with regular phones and tablets. What else competes with the Score-A? 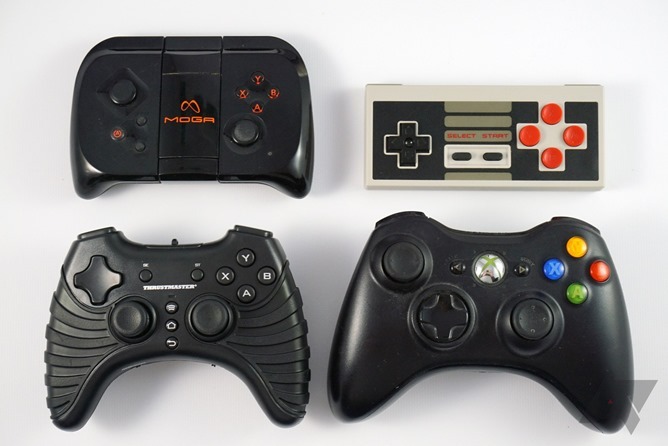 Well, there are the various models of MOGA, from the much-maligned original (hovering around $15 in bargain bins) to the full-sized Pro ($50) and the much-improved Power models ($60 and $70 for the "pocket" and full-size versions, but sometimes available at discount) which include rechargeable batteries for both the controller and the phone. The Score-A is a decent alternative to the expensive full-sized MOGAs, unless you can find them cheap. It's a demonstrably better controller than Nyko's PlayPad Pro, which is priced at $35 at the moment, connection and mapping issues included. Those who like the NES30 and similar compact controller designs will be put off by the Score-A's size, even though it's smaller than full-sized gamepads. But when you get right down to it, the Score-A is very difficult to recommend over the ASUS controller for the Nexus TV. Its small advantage in portability is outweighed by a slightly higher price and its mushy shoulder buttons. There's also the Mad Catz CTRLR, which costs an extra $10 and thus is slightly more expensive than the Score-A, but comes with an included phone clip. 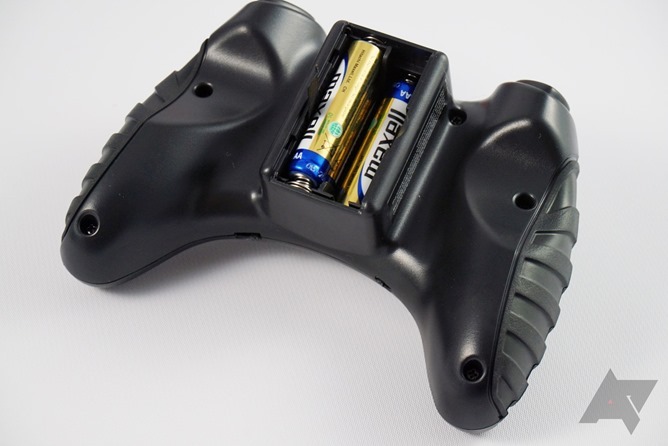 Those looking for something smaller (and often cheaper) would do well to check out the rechargeable MOGA Hero Power. If you can find the Score-A on sale - and that would seem to be likely sometime before the year is out - it's an acceptable alternative.